As much as we would love to be true craft queens, tackling the trickiest projects with the greatest of ease, sometimes our schedules (and our patience!) just won't allow it. Take, for example, the beaded bracelet: While painstakingly sewing bead after tiny bead might earn us some serious artisan cred, we say, why not settle for something easier — but just as cute? The artsy bloggers over at Home Heart Craft have whipped up the perfect faux beaded bracelet — no actual beading required. 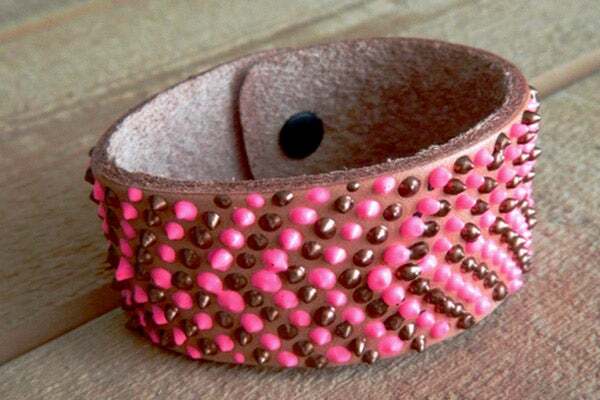 Simply round up some leather snap bracelets, some bottles of puff paint in your favorite colors, and a pen, and you've got the easiest DIY ever. The result is an adorable accessory you can wear proudly — and still have plenty of time left over for other hobbies (like shopping, napping, and brunching). Head over to Home Heart Craft for the full tutorial.